If you’re not acquainted with matcha tea yet, you need to be. Matcha tea powder is a fine-ground, luminous green ingredient made from pure tea leaves, originally grown in China. In recent years its popularity has spread throughout the western world for its energy-boosting properties and antioxidant content. People all over the world are swapping their caffeine-rich coffee habits for the healthy energy enhancement it gives, while containing half the amount of caffeine of an average cup of black coffee. Mix into a tea or latte for an instant delicious drink. After reading all about this super-tea, you’ll be hooked! Try today and have your All the Amazing Health Benefits of Matcha Tea own ‘Matcha Moment’ – trying the tea for the first time and being blown away, according to the creators of this excellent guide to the best matcha. Check out the guide for a rating of the greatest brands of powdered tea on the market to help you decide which to try. Read on for all the amazing health benefits contained in matcha tea, besides perking you up in the mornings. Matcha contains epigallocatechin gallate (more commonly known as EGCG) – an amino acid that increases fat oxidation when present in the body during exercise. In simple terms, this means that the process of burning body fat through exercise is sped up when EGCG is ingested; and this is present in abundance in matcha tea. For anyone looking to kickstart their metabolism and get an energy boost before a workout, have a hot cup of matcha before setting off for the gym. Sustain your immune system by drinking regular cups of matcha. No one likes being ill and having to miss work commitments or social occasions because you’re too sick to leave the house. Help to prevent this by eating and drinking as many antioxidant-filled foods as possible. Matcha contains the aforementioned EGCG amino acid, as well as polyphenols and catechins, which the body utilizes to help fight infection and ward off illness. If you work in a cramped office prone to colds and flu, or have a small child who picks up all the coughs and sniffles going around, keep some matcha tea powder to hand at all times! 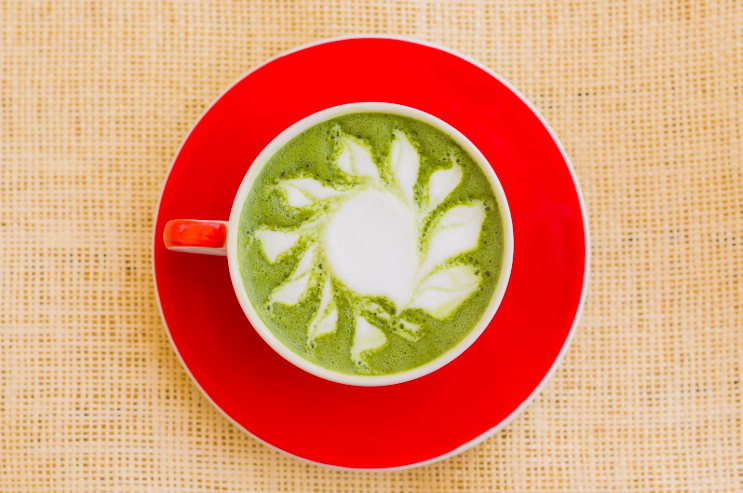 Bright-green matcha tea contains heaps of chlorophyll, which is the agent in the plant that allows it to absorb the sun’s rays and kickstart photosynthesis. This is obviously great for plants, but when used in humans, it helps to rid your skin of any dirt and toxins and protect it from chemicals. It is also said to prevent and treat sun damage when mixed into a paste and smoothed into skin – though make sure you always use a high SPF cream when you’re exposed to the sun. It can also fight acne and signs of ageing when applied to the skin. For these reasons, matcha is commonly used in skincare products like face masks that you can pick up at beauty counters and in drugstores. Matcha is rich in antioxidants, and due to its high concentration of nutrients, can actually contain the same amount of antioxidants in one cup as ten cups of regular green tea! It’s highly effective for flushing out toxins from your body after an indulgent weekend or just when you’re feeling run down. Put a spring back in your step with a shot of energy and nutrients with a matcha brew. Caffeine has been found to improve a person’s memory and focus. To give yourself a boost in the morning or during the working day, particularly in the afternoon when people tend to feel the most sluggish, brew yourself a pot of matcha to see you through until home time. Matcha tea contains the amino acid l-theanine, which is found to improve a person’s sense of calm while maintaining alertness and not causing drowsiness, as some calming medicines can do. This makes it a perfect soothing natural remedy for nervousness or mild anxiety.